Update: According to X17online.com, Brit has already handed over the kids. As soon as this is confirmed, OK! will let you know. Beleaguered pop star Britney Spears has lost custody of her children OK! can exclusively reveal. By order of the Los Angeles County Superior Court, she is to turn the boys over to ex-hubby Kevin Federline this Wednesday, at which point Sean Preston, 2, and 1-year-old Jayden James Federline will remain with their father until further notice. This decision effectively reverses the court’s earlier decision for Brit and K-Fed to share the boys for the duration of the custody hearing. It’s still not known what the underlying cause of the order is, but it could be Brit’s driving without a valid California driver’s license or perhaps the singer failed a court-ordered drug test. Regardless, reps for both sides in the case will return to court on Wednesday. "Respondent’s oral motion pursuant to section 214FC is granted and the matter proceeds as a closed hearing. The court and all parties present confer on the record that the court makes its order as fully reflected in the notes of the official court reporter. 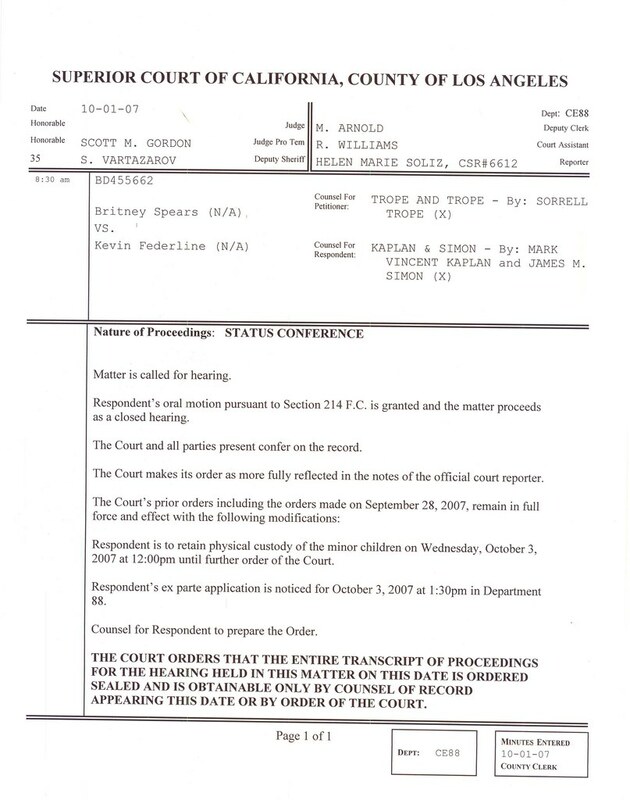 The court’s prior order including the orders made on September 28, 2007 remain in full force and effect with the following modification: Respondent is to retain physical custody of the minor children on Wednesday October 3rd, 2007 at 12 PM until further order of the Court. Repondent’s ex-parte application is noticed for October 3, 2007 at 1:30 PM in Department 88."